Around World War I a structure had been erected under the portico, most likely to insulate the interior from heat and cold. original source unknown. On the morning of September 11, 2001, the great doors to St. Peter's Catholic Church opened. Outside, beyond the tranquility of the sanctuary, dust and debris and screaming sirens filled the air. Four fire fighters entered the church, carrying the body of Franciscan Father Mychal Judge who was killed by falling debris inside the North World Trade Tower. Father Kevin Smith, who had been just blocks away when the attack occurred, followed the firemen into the church. Having blessed the body, he asked the fire fighters to lay it on the marble floor before the altar. Finding a stole in the sacristy, Father Smith placed it on Father Judge's body, along with his fire department shield -- Father Judge was the FDNY chaplain. Before leaving, the fire fighters placed a candle on either side of the priest's body. And then the sanctuary was tranquil again. 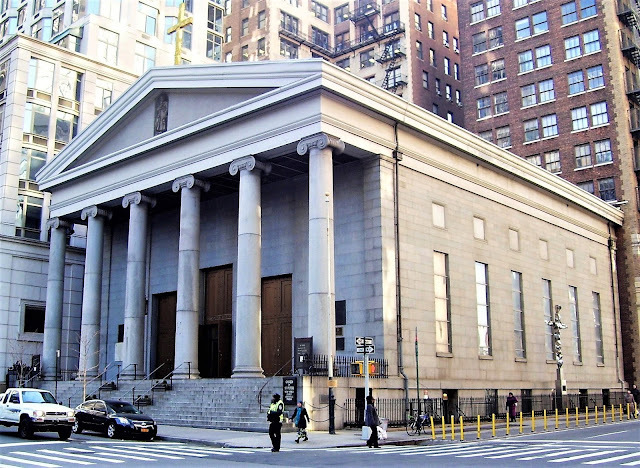 The church to which Father Mychal Judge was taken was built in 1840 on the site of the original St. Peter's Roman Catholic Church. 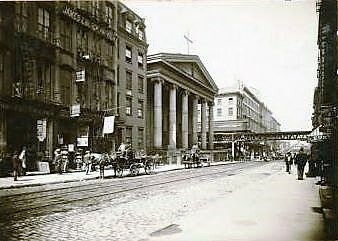 During British rule in New York, Catholic worship was prohibited by law. 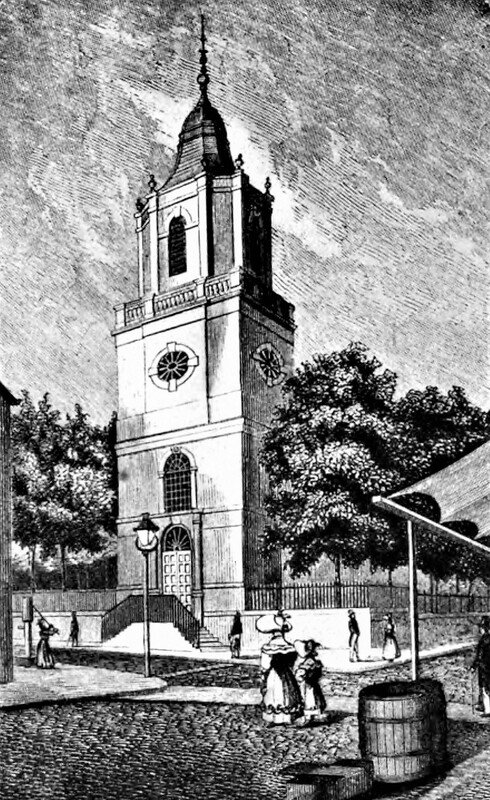 In 1785, almost immediately after the British left, St. Peter's was founded and a Georgian-style church was built on Barclay Street, three years before Washington took office. 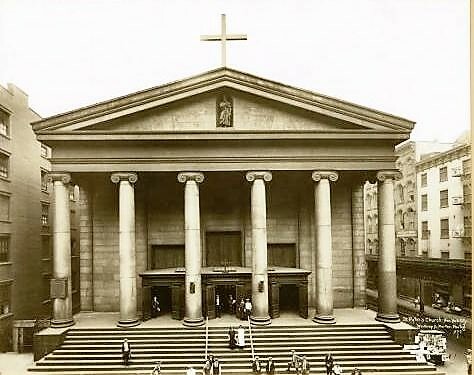 In 1836 the first of the six great granite columns of the present St. Peter's was erected. The parish had commissioned architects Thomas Thomas and John R. Hagarty who designed a monumental Greek Revival temple. 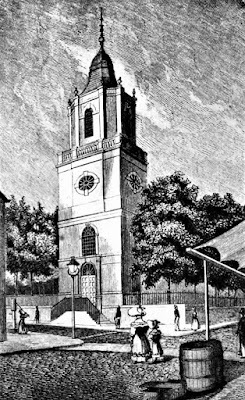 The architectural style was new, having its first precedent a few years earlier in the Church of the Ascension on Canal Street. Anti-Catholic sentiment in New York was strong at the time and the building, completed four years later, projected a sense of stability and strength. St. Peter's quickly made its mark in Catholic church history. Here Elizabeth Seton, who would eventually become the first American canonized saint, worshiped. And this was the church of Haitian-born slave Pierre Toussaint whose cause for sainthood was endorsed by New York Archbishop John Cardinal O’Connor. He was declared venerable by Pope John Paul II in 1997. It was here, on September 13, 1841, that Father Edward F. Sorin and six French brothers celebrated mass before traveling to South Bend, Indiana to found the University of Notre Dame. A basement fire in 1900 and serious cracking in the facade in 1911 threatened St. Peter's, but the staid old church survived. By the middle of the 20th century worshipers were mainly Wall Street businessmen and women who stopped by on their way to work or on their lunch hours. In 1993 a truck bomb exploded in the garage beneath the World Trade Center a half block away. Six people were immediately killed and thousands were injured. Beginning in 1994 an annual memorial service was held at St. Peter's for the victims of the attack. Then in 2001 the second attack on the World Trade Center hit closer to home. Before the body of Mychal Judge was laid before the altar the landing gear of one of the airliners crashed into the roof of the church, opening a 4-foot by 3-foot crater. In the days that followed rain and ash debris entered, damaging the walls and clogging the pipes of the antique organ. St. Peter's became one of the staging areas for responders and, later, FEMA. According to Father Kevin Madigan "Stuff was piled six feet high all over the pews -- bandages, gas marks, boots, hoses and cans of food for the workers." Emergency workers were sleeping in the sanctuary and downstairs. When FEMA moved in, they took over the building. "They had taken out all the pews, as well as the chairs with kneelers attached and placed them in the plaza," Father Madigan said. The same driving rain that poured through the hole in the roof destroyed the pews. The dust and dirt from the feet of all the workers eventually ruined the carpeting. Today St. Peters is pristine inside and out. Its classic early Greek Revival architecture is among the finest in the country. At the side of the church stands the huge steel-beam cross pulled from the wreckage of the World Trade Towers. Ernest Flagg's 1903 "Little Singer Building"